I am not a Southern gal. I’m descended from a line of stoic, fair-skinned, Seattle-settled Scandinavians. My exposure to Southern culture includes Gone With The Wind and, well, that’s about it. Growing up, I didn’t experience home-cooked Southern comfort food. And in recent years, as I’ve renovated my diet into a grain-free lifestyle, I focused on converting my own family dishes and creating new recipes. Recently, however, I Pinterested across a recipe for Sausage Gravy over Biscuits. “That sounds really weird and intriguing and strangely delicious,” I thought. And so, I was inspired to re-create the recipe in a way I could enjoy. Delicata Squash – In this rendition of the Southern favorite, I swapped Delicata squash boats for the biscuits. It makes the perfect vessel for the gravy, with less prep time and less carbs. 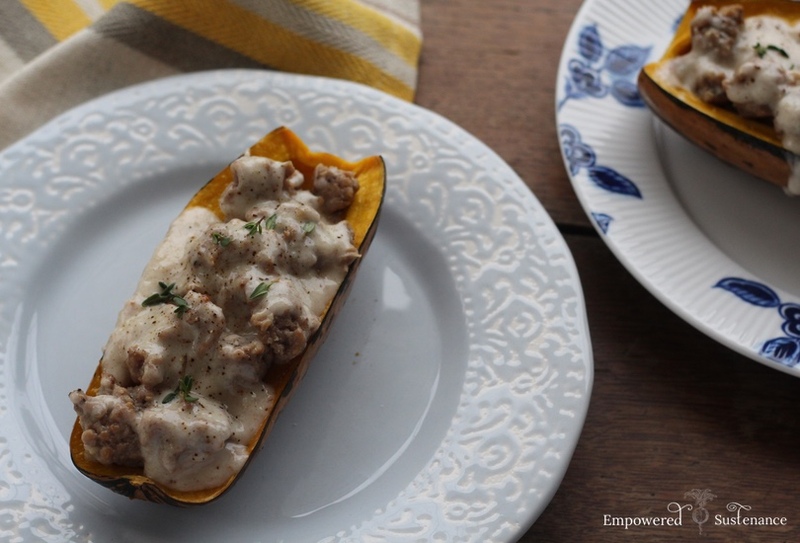 The sweet, creamy squash pairs perfectly with the rich sausage gravy. If you are unfamiliar with Delicata, the skin is tender and edible. Arrowroot Flour – Arrowroot flour is a grain free starch, used frequently in baking and to thicken sauces. (I use it in my No-Sugar Blueberry Sauce, for example). If you do not tolerate starches such as arrowroot flour, you could substitute my Starch-Free Paleo Gravy recipe. Sausage Meat – I recommend pastured ground pork or lamb sausage meat. If you do not have pre-seasoned sausage meat, or are allergic to some of the spices used, you can easily make your own. See the Notes section of the recipe. I like big breakfasts and I cannot lie… as evidenced by my breakfast plate below. I paired two duck eggs with a stuffed sausage (I went heavier on the sausage, lighter on the gravy, but added more gravy after the photo). 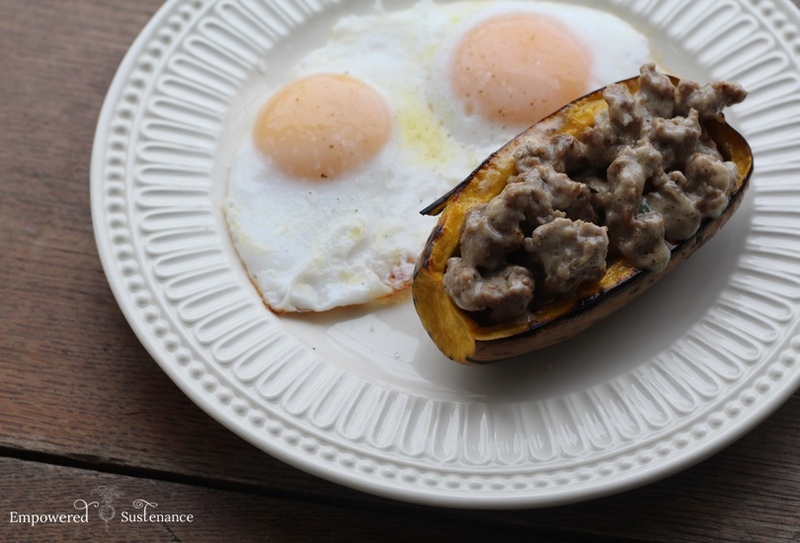 This paleo-spin on the Southern breakfast ditches the biscuits in favor of lower-carb Delicata squash boats. 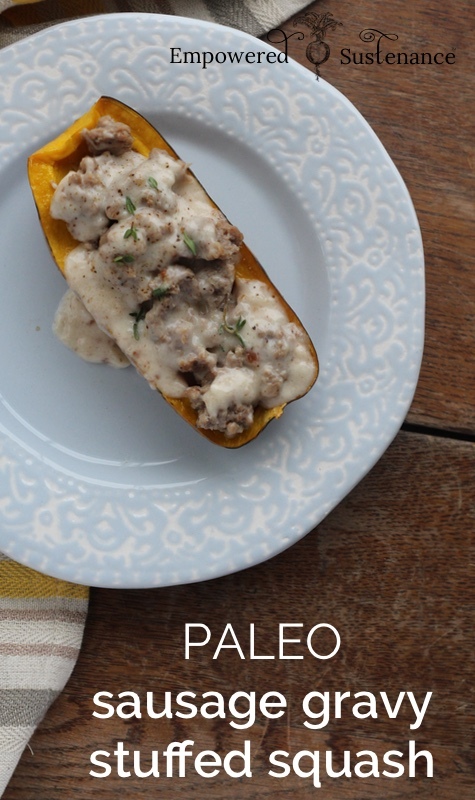 The Creamy Paleo Sausage Gravy is easy-squeezy and oh-so-comforting. A nourishing stick-to-your-ribs breakfast. Preheat the oven to 350. Line a baking sheet or glass baking dish with unbleached parchment paper. Halve the squash lengthwise and scoop out the seeds. Bake the squash, cut side facing down, for an hour, until tender. When the squash is almost ready, start cooking the sausage gravy. Brown the sausage meat in a skillet over medium heat. Remove the sausage meat and set it aside, leaving the drippings in the pan. You need about 2 tablespoons of grease to make the gravy. Add more ghee/coconut oil/bacon grease to the pan if necessary. Over low heat, add the arrowroot flour and stir briefly. Then whisk in the coconut milk (be careful when adding it, it can splatter in the hot pan). Cook for about minute, until thickened. If you want to thicken the gravy, mix 1 tsp. of arrowroot in a tablespoon of water, then whisk this into the cooking gravy. Do not add dry arrowroot flour to the gravy, because it will clump. If you want to thin the gravy, just add broth or coconut milk. Mix the reserved sausage with the gravy and season with salt and pepper. Serve in the piping-hot squash boats. If you have a prodigious breakfast appetite like me, pair with eggs for breakfast. I recommend seasoned pork or lamb sausage meat. Ground poultry is too lean, but ground beef will likely work. If you do not have seasoned sausage meat, you can season 1 lb. of ground meat by mixing in ½ tsp. pepper, ½ tsp. salt, 1 tsp. paprika, ½ tsp. garlic powder, and 1 tsp. fresh chopped sage leaf. I usually don’t care much for squash but decided to try this recipe anyway. It is soooooo good and I love delicata squash. This will be a staple for me and I love it’s versatility. Thanks so much!! !